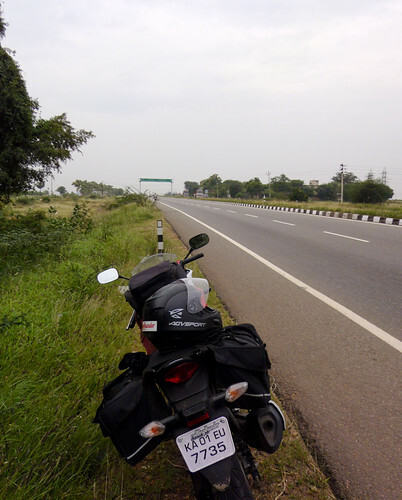 Discussion in 'Ride Reports - Day Trippin'' started by IndiBiker, Jan 2, 2013. I am a newbie to this forum but have been quietly reading/lurking up many of your amazing ride reports for months now. I am particularly inspired by the rides by Radioman, Feyala and kimangao. But that doesn't mean that any of the rest of you are any less. Its just that I have not yet got down to reading your threads! It is inspiring to read up on amazing rides of more than 10000 kms, riding around the world and amazing photos to complement them too. With this inspiration, I decided to do this ride starting from Bangalore - where I work/stay and ride down the south Indian coast line. Start off with the eastern coast - ride down to Kanyakumari near where my folks stay, spend Christmas with them and ride back up to Bangalore by the Western coast. But a bit of a background first - me and a friend had planned to do this ride in 2011 December. But I had an accident in the beginning of December 2011 and though I wasn't down and out, I couldn't ride for more than a 100 kms at a stretch. So I had to drop those plans then. This year, my friend couldn't convince his manager to give him leaves for that many days and he had to drop out of the ride. This really did put in a spanner in the works so to speak. The ride seriously seemed to be out of the question. At this time, I decided to go ahead with the ride alone. I had never done a ride this long alone and was really apprehensive. But seriously, your posts inspired me. If you guys can do thousands of kms in unknown countries, I could at least do a 2000 km ride in my own country. So without really telling this friend of mine, I started my planning. The main thing I was worried about was obviously breakdowns and medical help if required if was in an accident. I ride a Honda CBR 250R - which for me has been a wonderful and break-down-free machine in a year of owning it. I also have a Royal Enfield Thunderbird - which is a never-ending breakdown machine. I was obviously taking the CBR on this ride - with tubeless tyres and EFI - would be that more hassle free. Also, I'd never ridden in these State highways before. I wasn't sure of the road conditions. I asked around on some forums but didn't get too much information. But since the places I was visiting were all pretty big towns/tourist places, I wasn't too worried. This was my planned route map. Day 1 - 22 Dec - 300 kms. 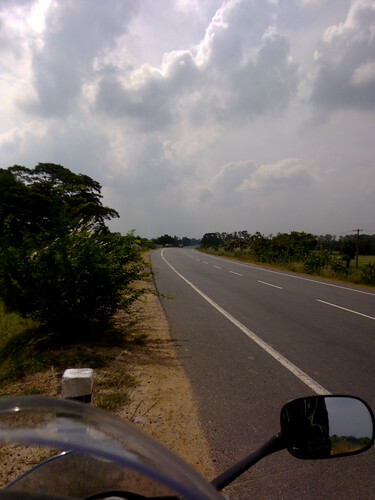 Ride from Bangalore to Pondicherry. Day 2 - 23 Dec - stay at Pondicherry. Visit some places there. Day 3 - 24 Dec - 150 kms. Ride from Pondicherry to Nagapattinam. Day 4 - 25 Dec - 260 kms. 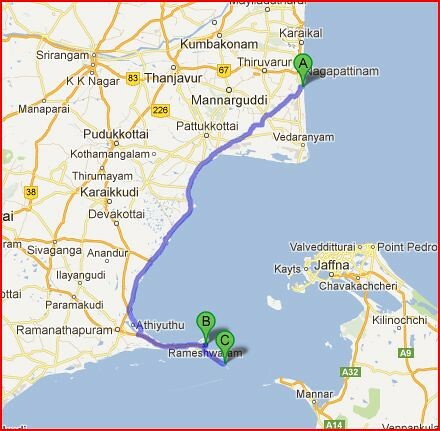 Ride from Nagapattinam to Rameshwaram. Day 5 - 26 Dec - 300 kms. Rameshwaram to Nagercoil - stay with folks. Day 8 - 29 Dec - 300 kms - Leave my home town. Head to Kochi. This was what I had planned anyways. What I ended up is another story. I checked out your photos, looks like you have the makings for a good story. Anyways, since I am not able to post attachments yet, I will be linking to my Flickr stream for the pics. Will continue my story today with the Day 1 events. I drove a VW bus (AKA= Hippie Van) around your country in 1973. The Meenakshi Temple in Madurai was an incredible sight. I look forward to your pictures and ride report. Thanks for your kind words! Drove around in a VW Bus in 1973 - amazing. What places did you visit? I wasn't even around then Yup, some of the old architecture is amazing here in India. My plan was to start my ride early in the morning and reach Pondicherry by afternoon, get a room in a hotel and take some rest. A friend who knows Pondicherry well was supposed to meet me there and we had plans of visting places. 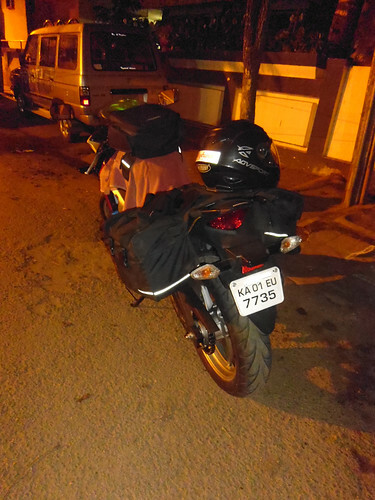 While I was planning all this, a friend - Jijo decided to join me from Bangalore to Krishnagiri - from where he would go ahead to Thrissur - his home town. Morning dawned fine and I was all ready at around 5:30 AM. I use Cramster saddle-bags and the Cramster tank-bag. These are pretty good enough for the short rides that I do. They fit well and are "relatively" water-resistant. Soon after that, we reached Krishnagiri and stopped for a chai (tea) and smoke. This is where me and Jijo would part ways on the ride. We did "nearly" catch up later on the ride :). More on that when I get there. After this small stop, I took the road to Chennai and soon had to move away from the National Highway to a State highway - with no way of knowing how good the roads were. In the beginning, roads were pretty good - my teeth rattled a lot but I was able to maintain speeds of up to 80 kmph. But soon, the roads deteriorated and I saw that there was a lot of road work going on. Or should I say - the roads were being paved over, but I did not see any machinery in sight. An already small 2 lane "highway" was just a one lane now. It was scary trying to avoid cars and buses who would not judge your oncoming speed and not give way! 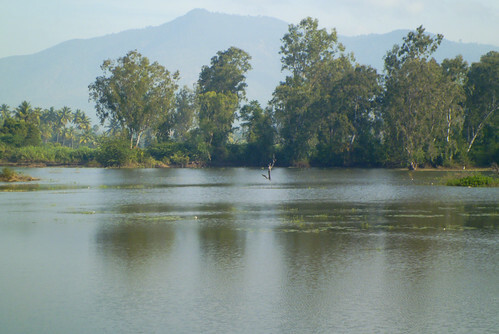 So I took a break to enjoy the scenery at a small lake - later found that it was a bird sanctuary? Moving on and I stopped for break fast at some small town. Don't even remember the name of the place but stopped at a roadside joint for some idlis (rice cakes). Its insane how cheap food is at places like this! 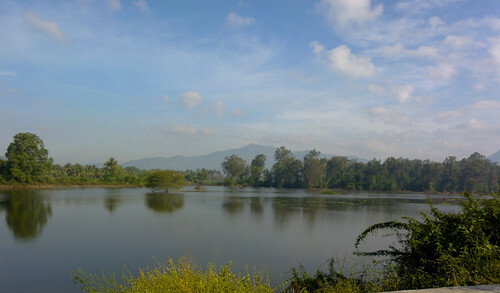 Riding on and I reached the small town of Gingee. Off the road is the Gingee fort - http://en.wikipedia.org/wiki/Gingee_Fort. 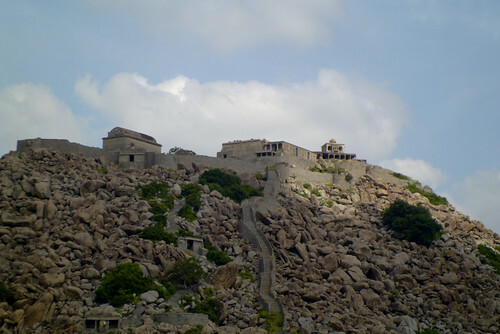 I remember reading about it ages ago in history lessons but the Wikipedia entry has more information about this fort. It says it is in good condition even now. And it was so impregnable in its time that Shivaji the founder of the Maratha empire called it "most impregnable fortress in India". History lesson over and I carried on with my ride. Roads were improving and I soon reached Tindivanam. This is where I saw the first signs of the road work being completed. 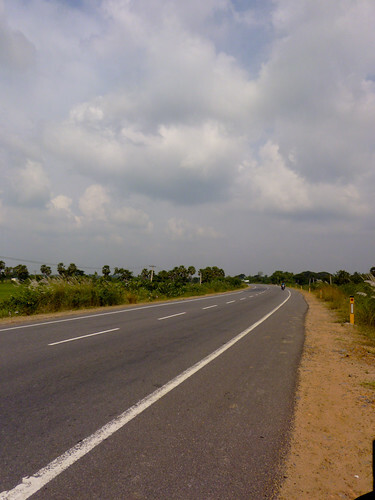 Really neat 4 lane highway greeted me and I rode on to Pondicherry. I soon settled in a small inn and took a well deserved rest. I'd done some 300 kms in 5 hours. Not bad, not great - considering the roads. I'd waited for my friend to arrive - she never did so I just walked around the French Quarter - taking in the french architecture that still survives. My actual plan for this day was to spend it in Pondicherry - visiting the Aurobindo Ashram and Auroville and get high on beer. 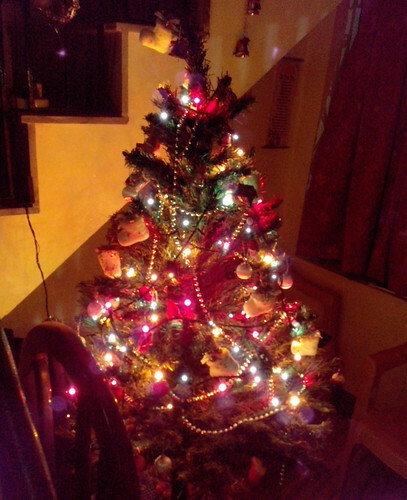 But I decided that it would be a better idea to travel home and be there with my folks for Christmas. I hadn't even told them that I was riding down the coast and that I would be home for only 2 days. <input title="" value=" So I quickly called up my friend who was supposed to meet me in Pondicherry and told her of the change in plans. Had a nice breakfast and packed up the bike. I'd stayed at a nice inn in Pondicherry - wasn't too costly but clean and neat. A night cost me 1200 bucks - around $21. The manager there personally took an interest in keeping the bike safe though it was parked on the road. He also offered to guide me to the road towards my next destination." 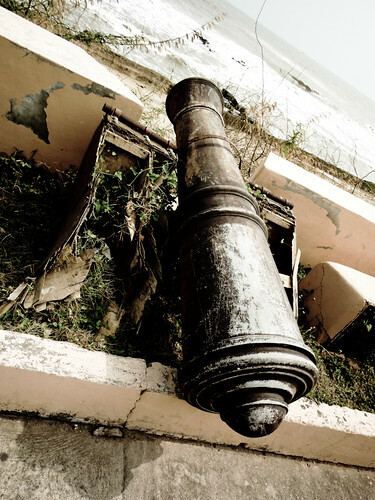 class="orgTextElmClass" type="hidden"><input title="" value=" So I quickly called up my friend who was supposed to meet me in Pondicherry and told her of the change in plans. Had a nice breakfast and packed up the bike. I'd stayed at a nice inn in Pondicherry - wasn't too costly but clean and neat. A night cost me 1200 bucks - around INR1,152.73 ($21). The manager there personally took an interest in keeping the bike safe though it was parked on the road. He also offered to guide me to the road towards my next destination." class="convertedTextElmClass" type="hidden"> So I quickly called up my friend who was supposed to meet me in Pondicherry and told her of the change in plans. Had a nice breakfast and packed up the bike. I'd stayed at a nice inn in Pondicherry - wasn't too costly but clean and neat. A night cost me 1200 bucks - around INR1,152.73 ($21). The manager there personally took an interest in keeping the bike safe though it was parked on the road. He also offered to guide me to the road towards my next destination. 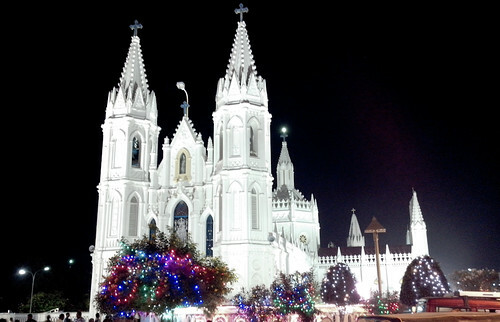 My next stop was Velankanni. 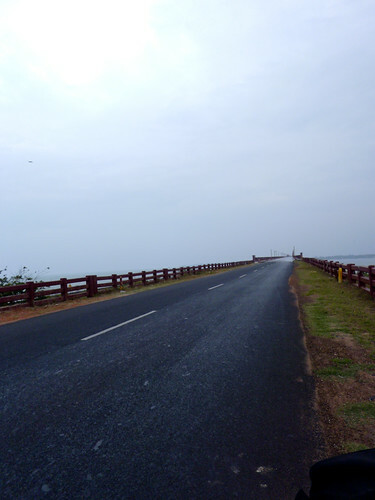 Its a short ride away from Pondicherry and the roads were empty and good roads all the way. (I really wish I can start posting images inline soon :huh ) - EDIT - I just did!! 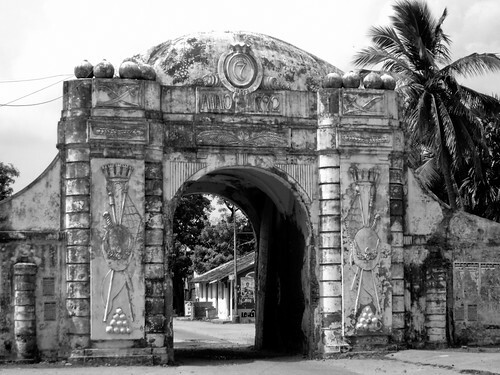 On the way, I stopped off at Tharangambady - this is the Tamil name of the old Danish settlement - Tranquebar. In fact, I guess the Danes still call it Trankebar. 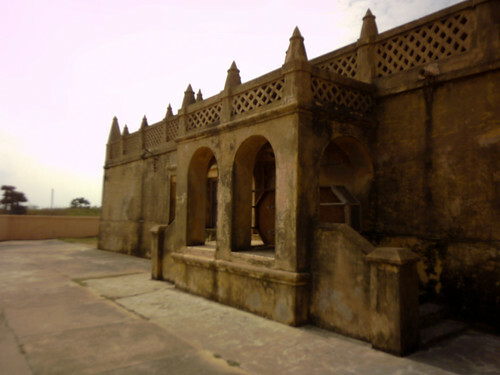 On the way to the Danish fort which still stands on the sea-shore, there is an old Danish church in great condition. People still use it for worship. I took a quick look-see inside the church and it was immaculately maintained. 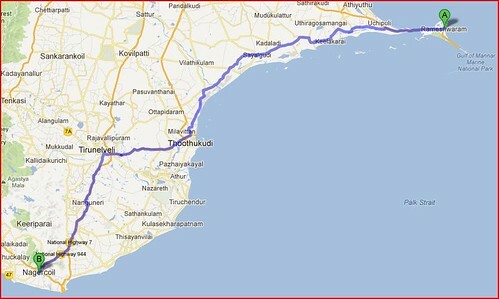 I decided to then ride onwards to Velankanni - a small town famous for the Basilica of Our Lady of Good Health. Tourists come from all over the world to pray and worship here. Reached the town much before noon - it was just a 170 km ride and settled in to a nice room. Good food - beef in the afternoon and I dozed off. Not a religious person, I am more interested in the history and architecture of places of worship. Naveen, Keep it up old chap! Good luck to you in your travels. Thanks a lot. I will be posting up the ride report for Day 3 soon. I woke up early at 5:30 to start off my ride towards Rameshwaram. 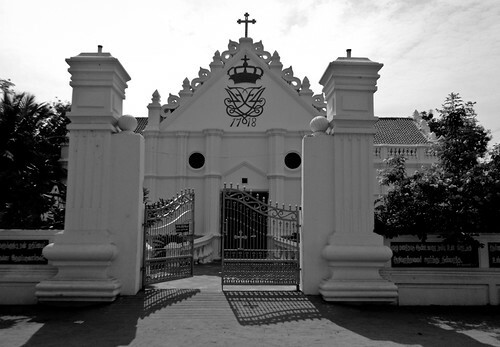 Though I was over-charged for a room at Velankanni - I was quite lucky to get a good room considering that it was Christmas eve and tourists pour into the town during this time. For me, this day (visting Dhanushkodi) would be the highlight of the trip. I have been absolutely wanting to visit for many years. I'd read about how the town of Dhanushkodi was destroyed in the 1964 cyclone - it had been a pretty prosperous town before that. On that fateful night, even a train full of passengers was washed away and everyone on board lost at sea. The cyclone changed the landscape and destroyed many people's lives. Many fishermen were lost in sea. Around 1800 people died that day. Dhanushkodi has been declared a "ghost town" though fishermen still eke out a living. 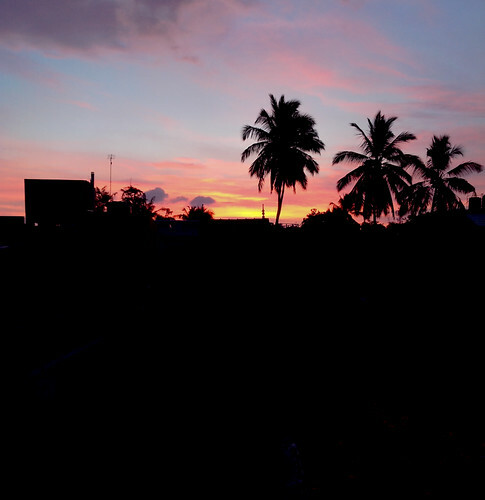 I had the route to Rameshwaram mapped out and confirmed it by checking with the hotel manager. The roads were supposed to be all good - all the way till Rameshwaram. Fingers crossed and I started off, only to stop and tighten the bolt for my rear-view mirror. Someone had surely meddled with it sometime. Early morning, the roads are incredibly empty on the state highways - just the way I like it. Riding on, you start seeing the salt pans - where they evaporate sea water to harvest salt. And the land becomes water-logged. I stopped for breakfast at a small road-side joint and had some idlis (rice cakes) for Rs.10! The same would have cost me Rs.40 in Bangalore. Amazing. I wish I'd taken pictures of that. Riding onwards, I could smell the sea and finally neared Rameshwaram. Its a little creepy to see that you are riding on a road and both sides, the sea is storming. And I finally reached the Pamban bridge - which was also washed away in the 1964 cyclone but rebuilt. Reached Rameshwaram in a short while and had a really hard time getting a room. Most of the rooms were occupied and wherever I asked for a room, I was told that the police had instructed the hotel owners not to give rooms for young couples and single men! Bwahahahah - one is the moral angle - we Indians like to think we are morally superior to other people on the planet. The other one was the terrorist angle - single men who want to visit Rameshwaram might just turn out to be LTTE operatives or people who support the Tamil struggle in Sri Lanka - which is just a few kilometers away. I've been told that at the right tide, you can easily swim across or hire a canoe to take you to Sri Lanka. Anyways, I finally had to end up taking a really disgusting room with no AC. Hated the place but since I would be leaving early in the morning, decided to just bite the bullet. And I was also very excited about visting Dhanushkodi. I settled in and had a nice lunch and decided to visit Dhanushkodi. I asked around and was told that they do not allow tourists after 5 in the evening - guess thats when the tide comes in. I was told that it is just around 18 kms away from Rameshwaram and that I can leave the bike there and hire a van/jeep to take us to the old Dhanushkodi town. Since I was riding alone, was a little worried about leaving the bike unguarded but my excitement overtook my fears and I started off towards Dhanushkodi. The ride towards the place was amazing - as you can see from the map, it is like riding into the ocean. A narrow road and you can see the oceon on both sides - sea level! Reached the place and it was filled with cars and SUVs. And people. All wanting to hire the van/jeeps to take them to Dhanushkodi. I knew that I would stand no chance if I bought a ticket for a back-seat in the van and quickly approached a driver and asked him for the front seat - next to his driver seat. He asked for a 100 and I was fine with that. Because I wanted to take pictures. Thats me and the driver - Udaya. You can see these ruts in the sand in the following pic. If you do lose driving in the rut, you are sure to get stuck in the mud! We finally reached the erstwhile town of Dhanushkodi and I saw this temple. What is written on the wall is - "This temple was built before the Dhanushkodi cyclone"
A shot of the vans that transported us tourists! Just take a look at their tyres - totally bald! I would have loved to take my bike there but I am sure it would have just got stuck in the mud. Some of you might find this insane - thats a pic of the diesel tank - it was connected to the engine by a plastic tube. It was kept near my feet. We started back by then and after getting dropped back, I paid the driver a 100 and was anxious to check back on my bike. 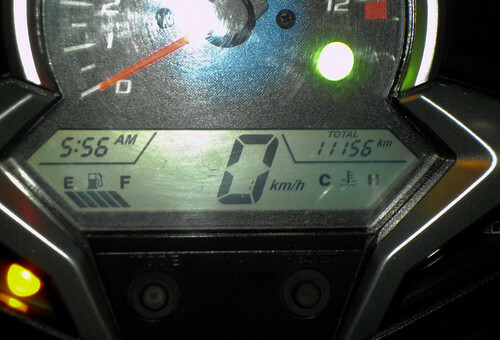 Thankfully, no one had moved it or anything and I rode back to Rameshwaram. Took some pics of the bike on the way back. I had an awesome time going to Dhanushkodi. Some friends tell me that a few years back, they would even go further ahead into Dhanushkodi. I was even told that some years back, you could stay back at dusk and could see lights shimmering in neighbouring Sri Lanka. What I would have given to see that. This is where I was. As you can see from the map, there was even an old Port. My dad told me that he had taken a ferry to Jaffna in neighbouring Sri Lanka from here. It is all in ruins now. Somehow a very haunting scene - to take it all in. As I rode back to Rameshwaram, I felt sated already. I felt that I had accomplished what I had come on this ride to do - visit Dhanushkodi. I somehow felt that anything after this would be just a ride into a town and ride out. This was the zenith of my ride. Subscribed. this does make me home sick. Are you from India? Or maybe settled in the US? My original plan was to ride to Rameshwaram on this day. However, since I'd changed my plans and decided to visit my folks for Christmas, I decided to start off early in the morning from Rameshwaram to head to Nagercoil - my hometown. 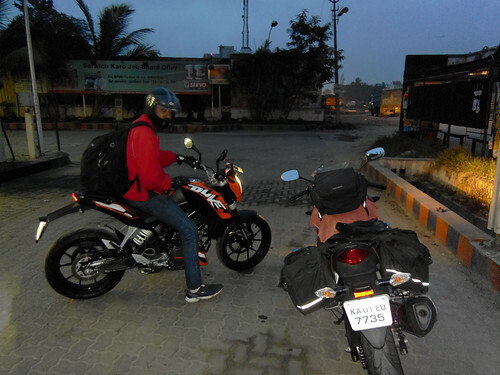 I started off from Rameshwaram at around 6 in the morning. The roads are the usual East Coast Road - good roads - though 2 lanes. Not too much traffic. Sadly, I didn't take any pics. The lovely roads continued (single lane - just enough for a car) and passed through sleepy villages. Only problem - I seemed to lose my way a bit. Small kids would run out dreamy eyed to see this insane looking robot riding a bike. But soon enough, I caught up the East Coast Road and continued until I made the mistake of taking a "short cut". The short cut took me around a bit and looking back, I should have just carried on in the ECR road. But nonetheless, it was nice riding in empty desolate roads. I finally caught up with a villager who was so astute in his knowledge of the roads. He gave me perfect directions and said it would be wise for me to join up the ECR, reach Tuticorin (which is called Thoothukudi now) and ride on from there to Tirunelveli. Going by his directions, I reached Thoothukudi and asked for directions on how to reach the next section of road. Glad that I had some people with good knowledge of the roads to help me. I caught up to Tirunelveli in no time. From there, it was just a short distance to my hometown. I'd let mom in on the secret and had asked her to have lunch for me too for Christmas day. I reached home around 12:30 in the afternoon - dad was shocked and happy to see me. So it was a lazy Christmas lunch. Good to be with family on a holiday. Did nothing this day. Rest, sleep and eat. 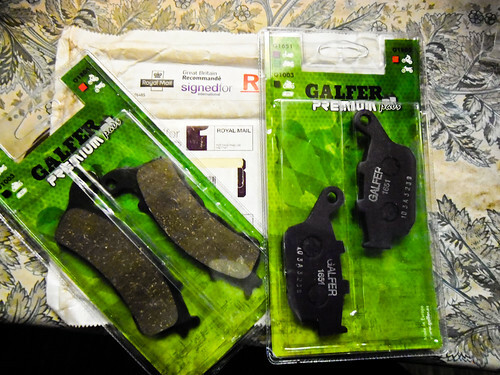 My folks had received the Galfer brake pads that I had ordered from the UK, so I'd planned to get it fixed. Checked with the Honda service center and they asked me to be there at 6:30 in the morning the next day. Took a short ride to Kanyakumari - land's end. Been here too many times to count so it was just a sort of formality to show that I did touch Kanyakumari too. Too many tourists. Boring! 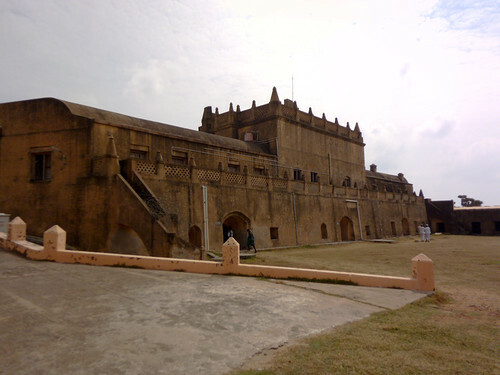 But you can see some pictures of Kanyakumari from one of the groups on Flickr. Nice narration and good pics Naveen. Brought back memories of my somewhat similar ride back in Dec 2010 starting/ending in namma Bengaluru . I am from chennai, moved here around 10 yrs ago. i did alot riding there and now here. i remember my kawi 175 was a big engine then ,now seems like you get bigger bikes. I also had a suzuki shogun , 21 bhp and it was the fastest thing on 2 wheels .... .
Woohoo! Thanks for the support Haroon! Your bike ride in Europe with your wife along - awesome stuff. Guess I read it in Team-BHP. Yes, those awesome bikes. I had a Suzuki Max 100 R and it awesome for its time. Thanks for your support too!! Good one Naveen. Keep them coming. On this day, I didn't ride any long distance. I was chilling out at home and wanted to get the Galfer brake pads fixed. The ASC (After Sales-service Center) had asked me to come at 6 AM to get it fixed. I was a little skeptical that they would be open at such an unearthly hour but was there by 6:30 AM. And true to their word - they were open! But sadly, their CBR technician was away and I couldn't get it fixed that day. I later on found out it was something I could have done myself. Anyways, it was a good day relaxing and having some great home cooked food. I leave you with an awesome view of the morning sky from my room at home. I'm kinda getting bored of writing up this report but will persist and finish it. Just a few more days to go on the RR. December 28th dawned nice and overcast. In fact, it started raining at around 6 in the morning. 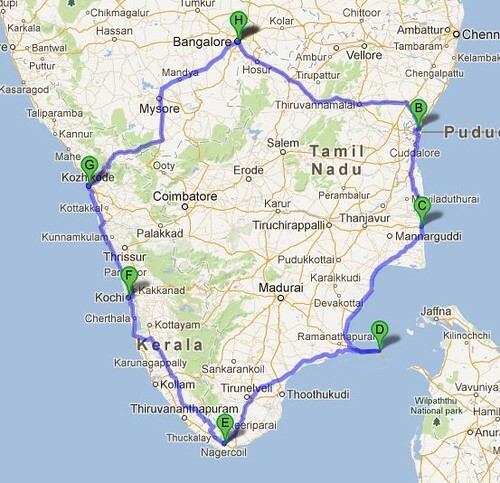 My dad was already anxious that I was riding around Kerala and would be reaching Bangalore only in 2 days. 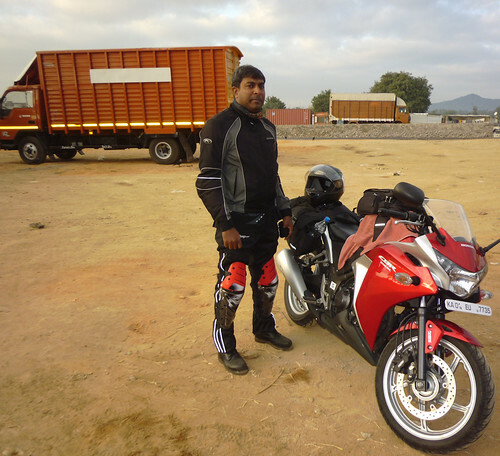 He still wanted me to ride off straight to Bangalore - a ride that I have done before and around 700 kms. And the rain wasn't helping me either. My mind was playing games with me and making me really unsure. Slick roads, lousy drivers in Kerala - especially the bus drivers. And there weren't any big highways either. The 80 km ride to Trivandrum was one of the most traffucked roads around. Good that a friend of mine had suggested that I ride till Kovalam beach, take a right and then ride on to Kottayam - a nice state highway. Around 5 kms away from my home, it started raining. I quickly pulled on the rain cover for my tankbag and carried on. Thankfully it stopped after a while and I was becoming more confident of the ride. 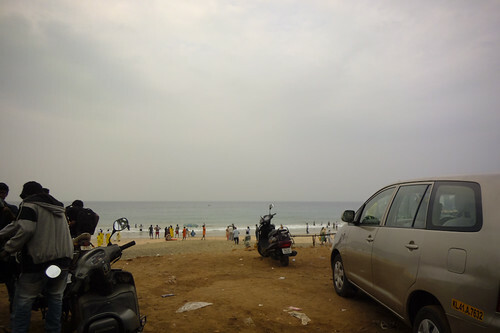 Nearning Kovalam, I called up my friend so that I could meet up with him. His wife picked up the call and he never did turn up at the point - later the bugger told me that he was really late and his mornings are really bad. Well....good chance to meet an old friend. I asked some cops for directions and stopped off at Kovalam beach for a quick pic. The number of pictures that I took on this return ride were very few so pardon me. Had a quick breakfast and carried on towards the road to Kottayam. Very nice, 2-laned road with no median in the middle though. Less traffic and I made good time. Or so I thought. Roads deteriorated after that and traffic was pathetic. I reached some place past Kottayam and had a relaxed lunch. Reached Kochi beach around 3 in the afternoon! Pathetic. I scouted around for a room and got some really awful rooms for a high price. Blame it on the foreigners who come and splurge their money here. And at one hotel, I was even treated like some third rate citizen cause they thought I could not afford their rooms. Bastards! Anyways, made a run to Ernakulam and landed a nice room for less. My friend Jijo called me in the meantime and said he is in Ernakulam also. But sadly, I could not meet him either - we both had network issues with our phones and couldn't call each other. But I didn't mind as I was dead tired. Dead tired. Quickly had a shower, and a good long rest. Had a couple of beers after that and some awesome beef curry with Parottas - my favourite! Good sleep and was off to bed to continue on my ride the next day.